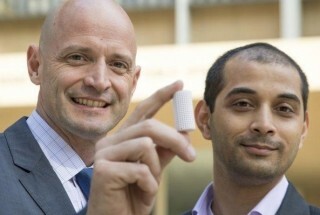 Researchers from the University of California Los Angeles have found a way to turn carbon dioxide emissions from power plants into a novel building material that could replace concrete. CO2NCRETE is fabricated by 3d printers using carbon dioxide that has been captured inside the smoke stacks of power plants. The technology would not only reduce the harmful amounts of CO2 released by power plants, but also that of traditional concrete itself, which currently accounts for 5% of the world’s carbon emissions. The next challenge facing the minds behind CO2NCRETE is finding a way to efficiently increase the size of the finished product so that it can be used in the building industry.